Ok, take a deep breath. Breath in slowly… breath out. Breath in slowly… breath out. Here goes… as the end of March approaches, Matt and I have come to the stark realisation that we have only three months left in London. Yes, we knew we were only going to be here for a limited time but where did that time actually go?? Last we checked it was Christmas and we were on a sleigh getting pulled along the snowy ground by mighty husky dogs in Sweden and saying ‘six months left’. It seemed like forever. Now, all of sudden we’re researching shipping companies to ship home our accumulated goods, looking into renewing our travel insurance for the last time and making plans for the trip home. We’ve even booked our flights back to Oz (shock horror!) and now there’s no turning back. Or is there? Lately we’ve been thinking about how lucky we’ve been in our lives in the UK, or more specifically, London. London has given us throngs of possibilities, opened doors for our careers and thrown us into some of the most memorable experiences we’ll ever have, all without even asking for it. I don’t know how people feel back home, but I don’t think Toowoomba, or even Brisbane, is going to live up to the benchmark that London has set for us. Where in Brisbane will we be able to meet a Prince, shake hands with celebrities on more than one occasion, walk past the most beautiful century-old buildings on the way to work (hell, I even work in one!) and experience exclusive ‘London only’ opportunities like running in the brand new London Olympic Stadium (six days to go!) and to be official photographer at some of the most prestigious events for one of Britain’s ‘2012 CoolBrands’. For some reason I’ve walked across Waterloo Bridge quite a lot recently and every time I look to the skyline and see the magnificent dome of St. Paul’s cathedral, I sigh and feel sad about the thought of leaving a place that is so stunning and that has been so good to both of us. But then I think of what awaits us back home. Without a doubt, the one key thing about going home is the chance to see all our family and friends again. We have four babies to meet – some yet to be born – and missed witnessing the marriage of friends. There’s no explaining how much we have missed these experiences and more importantly, the very important people in our lives to the point that we feel it has really come time to leave. We are also excited about the possibilities in terms of work – our CVs have been enriched by our experiences here and we cannot wait to settle down and make a home for ourselves again. For the chance to drive and to visit the beach and to experience sunshine for more than one consecutive day in the row will be absolutely lovely to make part of daily life again. However, I cannot help but take notice of that nagging question still running through my mind… what if we stayed just a little longer? Now don’t go getting all ‘up in arms’, you don’t have to worry, of course we are coming home and I don’t think we would change our minds at this stage. I just think that it’s taken this long for us to actually feel part of the city and we’ve gotten to know it quite well. Sure we’ve merely scratched the surface of things to do here but it takes time to immerse yourself into a city and to set up a life. Only now do we feel that we’ve gotten to that point and it makes me wonder what our lives would become if we were here for a couple more years. Where could London take us given the chance? I guess my consolation lies in the fact that we could always come back, alas not on a working holiday visa, but perhaps if we get to the point where we could be ‘highly skilled immigrants’. The enticement of further possibilities in London will mean that we may never really rule that possibility out. At the moment however we are on that plane back to Australia and are very much looking forward to it. But in the meantime, we’re making the most of our last three months in London and we cannot wait to make it the best three months ever! 1. Underground buskers… Get off the train, ‘mind the gap’ and walk the mile (as it feels like sometimes) to our next underground line and in the distance we hear the sound of the bagpipes, or it might be a tune whistled by a very talented guy, or, it’s the strum of a guitar or the powerful voice of an opera singer or the soulful tunes of a jazz musician. The underground buskers are amazing and they lift your mood at the start of another work day. Or, it’s the perfect end on the way home from a night out. 2. A city for walking… and aimlessly at that as you never know what you’ll come across in the diversity of neighbourhoods that make up the great city of London. From fashionable Soho with it’s variety of trendy bars and cafes; to Hampstead and Belsize to rub shoulders with incredibly old and beautiful suburbian London with it’s massive Hampstead Heath; to East London with it’s markets and famous Brick Lane; to Surrey Quays, our home and a not too shabby walk along The Thames. There is nothing more we love than going for a walk on a lazy Sunday afternoon, discovering new gems and embracing what London has to offer. London 'street art' off Brick Lane. 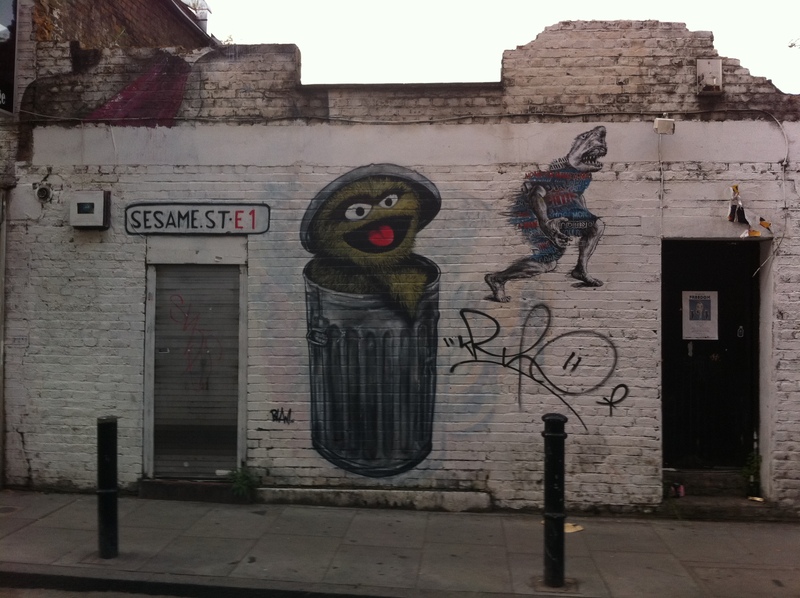 You can find street art everywhere in London - you just have to keep your eyes open for it. 3. The seasons… OK, not so much to do with London, but with the country we’re living in. There are four distinct seasons. Blossoming spring; intermittantly hot and more-often-then-not, rainy, summer; golden autmn and cold and dreary winter. It makes for an interesting year rather than moving from hot to not-so-hot back home to mark the beginning of winter. Even as we approach mid-August, if you look hard enough, some leaves are already starting to hit the ground. 'Our park' along our street. These golden leaves will cover the ground soon enough. 4. Majestic sights… Sitting on red double-decker bus #188, we drive past Waterloo, over The Thames, past London parliament and Big Ben, through the city streets to Russell Square. Look left and you can see the London Eye, look right and there is Tower Bridge and the Tower of London. The dome of St Paul’s cathedral can be seen poking out of the city skyline across the river. Living in such close proximity to these absolutely amazing sights gives us butterflies in our stomachs. We actually live in this city and we can see these most famous sights whenever we please. It’s such an amazing feeling and I think we will miss this when we eventually have to leave the great city of London. The view from the bus. We'll never get sick of this. 5. Parks… in all their beautiful, green glory. Kensington Gardens, Hyde Park, Kew Gardens, Regent’s Park, Southwark Park… all beautiful spaces with neatly manicured gardens. London’s parks are home to squirrels who scurry across the path in front of us as we walk through, with gravel paths that take their walker between flowering garden beds and giant trees standing tall and magestic. Strolling through these parks and gardens is the perfect way to spend a lazy Saturday and the perfect way to get amongst London at its very best. When I finished cycling through rural China on a fundraising challenge I wrote in an email back home: “I rode 400km through China on a bicycle and I’ll be glad if I never see one again!” I can eat my words because I’m getting back on the bike to train for another fundraising challenge, this time through rural England. Through The Prince’s Trust, I have signed up to participate in the Wild UK Challenge in a team with three other girls. We named ourselves Charlie’s Angels (and I realise there is four of us!) and we’re all excited about going out there to ask for pounds for young people and to follow a scarily looking training regime. I say regime, because it really looks like a military-style exercise schedule that now sits on our fridge, reminding me every time I reach for the ice-cream or chocolate, I should be running around our park across the road instead. But hey, I guess this gives me something to aim towards – to get fit so I can complete the 100 miles of combined hiking, cycling and kayaking in three days for the challenge. The team makes it easy to get motivated and I’m sure the excitement will escalate! So, as a gentle hint and reminder for my birthday coming up in early July, I’m going to be asking all my friends and family back home to throw me a tenner (or a fiver, or whatever you can spare) in lieu of any birthday gifts. Please donate towards The Trust. Did you know that The Trust has to raise £1 million every single week to help young people get into education, jobs, training or volunteering. Since The Trust was started in 1976 by HRH The Prince of Wales, over 650,000 young people have gone through a Prince’s Trust programme. Quite an achievement, but there is still more young people out there who haven’t had the opportunity to finish school, to further their education and job prospects, or to simply get the training they need to even get themselves considered for a job. You can donate towards our team here, or you can click on my name to sponsor directly to me. I’ll definitely keep you all updated with how Charlie’s Angels is going!